Deb's Cup of Tea: Come Girls! Walkies! I was cleaning off the front steps in preparation for a refresh painting as soon as it warms up. (42 on Friday, May 10th. Really.) I found this off to the side and got such a kick out of the mental image it presents. In actuality, I checked with my vet and a couple of people I know who have pets and they don't have complaints about this company. They offer care for cats which includes litter box cleanings in addition to feedings. If Pam's schedule made it impossible for her to visit the girls, I would give these people a call to see what prices were for dropping by for feedings. A number of people have said, "Oh it's just cats. You can leave the food out and they will be fine." Um...no, no you can't. Cats require no need to go outside to do their business, this is true, but they need socialization as much as dogs do. You need to provide fresh water daily and you should be checking on them to see that they are not hurt. In a multi-cat home, arguments can erupt and that can result in someone getting hurt. Two years ago, Mija bit Pilchard in the chin when I was gone for the office Christmas party. I didn't find the bite until it had abscessed, two weeks later. Something like this can make a cat very sick so having someone check on them daily when I'm gone eases my mind. Pam, I had a discussion with Mija about hissing at you. She says she's sorry. She was stressed that I was gone, again, and that Pilchard had been chasing her through the house. She'll remember her manners next time. What I got the biggest kick out of with this door hanger was the idea of Pilchard out for walkies. Neither girl goes outside for very long, even when invited to come out on the deck and get fresh air. The slightest louder than bird song noise and they are both back inside the house. I'm okay with this. I don't have to worry about them going some place they shouldn't. Now Faux, my daughter's cat, has been harness trained. He will "walk" around on a leash. I put "walk" in quotations because you're, more or less, allowing him to smell his surroundings, going where he goes, but not really walking as you would a dog, down to the corner and around the block. First of all, getting a harness on either one of my girls would require duct tape and the 3rd Infantry Battalion. Then, getting them to come outside with that thing on would really mean I'm dragging them out. And lastly, a walk? Are you nuts? We'd get to the deck steps, forget about going out the front door, and they'd bolt back inside. 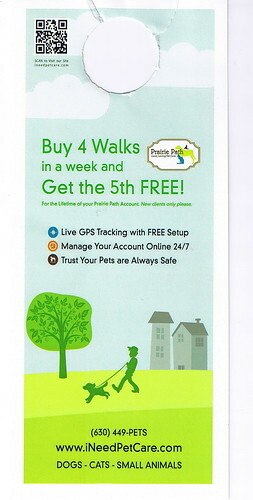 A fifth walk free? Does that include getting them down the deck steps? I'll keep this. It may never come in handy and then again, it might.